The digital version was released online on May 22 while the physical album was released on May 24. “My Everything” is a combo that contains a CD, a DVD and a 70-page photobook intended as a gift to his fans around the world. Lee Min-ho prepared the album for two years. A part of the album sales will be donated to charity. He will perform the songs in the album at his fan meeting in Korea scheduled today, May 25, at the Kyung Hee University Grand Peace Palace in Seoul. To promote the album, Lee Min-ho will hold his first “My Everything-World Tour 2013” in Asia, which will see him visit the Philippines, China, Taiwan, Japan, Malaysia and Thailand. “Fans in Manila will be able to see Lee Min Ho perform live for the first time, as he will be singing songs from his new album, ‘My Everything,’” Glenn Llamas of Wilbros Live told Bulletin Entertainment. 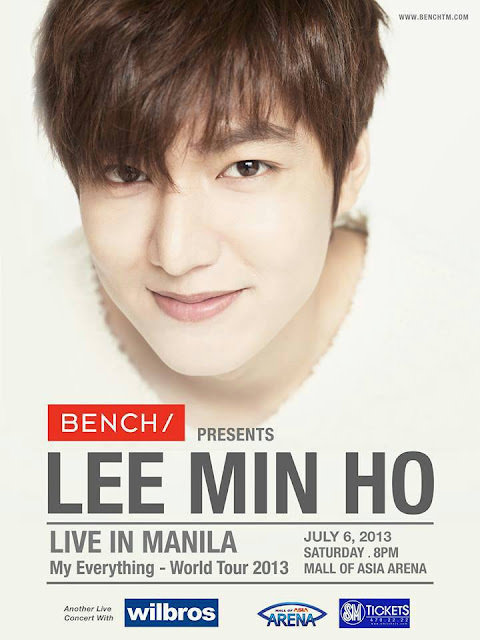 The “Lee Min-ho Live in Manila: My Everything-World Tour 2013” will be held on July 6 at the Mall of Asia Arena in Pasay City. As a local clothing brand endorser, Lee Min-ho visited the Philippines last November for his fan meeting and mall tour. “So this time, fans can expect more – see Lee Min-ho perform live and interact with him as well,” said Llamas. According to Korean media, the actor's world tour will combine a talk show and live concert format. He would like to thank his Filipino fans for all the love and support, and because of that, he is dedicating this concert for them. He is excited to be back and be with his Filipino fans again,” added Llamas.